Last year I wrote two articles that compared Android to iOS. One stressed Apple’s advantages, and the other stressed Google’s advantages. Both turned out to be extremely popular. Since each operating system has had a major new update since then, I’ve decided to update both articles. Android has come a long way since my first post, so far that some experts feel it’s reached parity, but iOS still has a few important advantages. 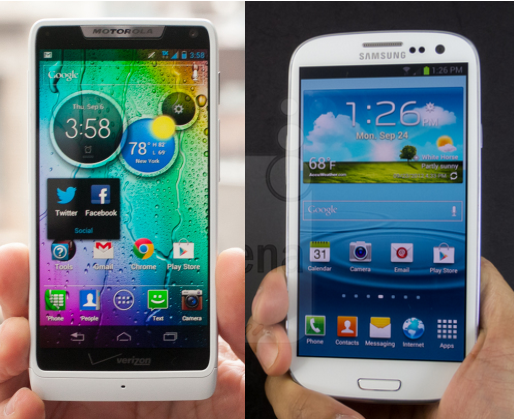 Earlier this week I listed Android 4.2’s advantages over iOS 6. Here are the advantages that iOS 6 has over Android 4.2. Better Overall App Quality – Google Play has almost caught up to Apple in the total number of apps, but there is no doubt that Apple still has the edge when it comes to the number of quality apps available — especially in categories such as games, media creation and children’s apps. More Consistent User Experience – Some reviewers have complained that Apple hasn’t made any major changes to iOS since the first version. That may be true, but it’s not entirely a bad thing. The user interface on every iOS device is very similar. By contrast, the Android user experience varies greatly from one manufacturer’s device to another due to skinning. Fragmentation is also a problem on the Android platform. Sixty percent of all iPhone users are running the newest version of iOS, while less than 5% of all Android users are running the newest version of Android. Because carriers and handset manufacturers don’t make all Android updates available on every phone, over half of all Android users are still running version 2.3, which was released back in 2010. Apple doesn’t allow skinning, and most of the time allows users with older devices to upgrade to the newest OS (although they may not always get access to all of the new features). This results is a more consistent user experience. 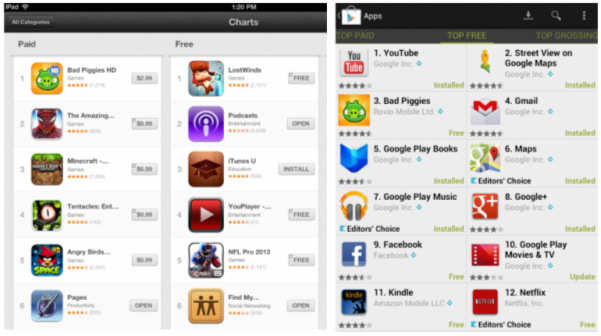 Tablet-optimized App Listings – The App Store displays iPhone and iPad apps in separate areas. iPad-optimized apps normally look better on tablets — because they have been modified to take advantage of the larger screen which tablets have. I wish Google Play had a filter for tablet-optimized apps. No Carrier Bloatware – Carriers preload their Android phones with loads of apps. Some promote paid services (e.g. VZ Navigator), while others are carrier-branded or third-party apps. Many preinstalled apps are things you don’t need and will never use. They clutter the screens of Android phones and often cannot be deleted. Apple doesn’t allow carriers to install bloatware on their products. While you could argue this isn’t an operating system-related advantage, it is an advantage that iOS users have over non-Nexus Android users. A Better Personal Assistant – Although Google Now is pretty good, the version of Siri which is included with iOS 6 has some advantages — including more human-like and actionable responses. Here’s a good comparison between the two. More iOS-only or iOS-first Apps – By now you’d think all popular apps would be available on both platforms, but that’s not the case. Android is still missing some popular iOS apps. To make things worse, even when developers support both platforms, they often release their iOS apps first. Better HTML5 Support – Although Flash is still a popular way of handling multimedia on the Web, many people believe HTML5 will one day replace it. Instead of supporting Flash, Apple put its efforts into supporting HTML5 and it shows. Dynamic App Icons – iOS may not have widget support yet, but I love how the icon for the Calendar app displays the current day and date. Folders and apps like Spotify also are capable of showing notifications. Global Search – Swiping to the right displays a screen where you can search for Apps, Calendar, Mail, Music, Notes, Web and Wikipedia. This is a pretty big deal and Apple has shown they will litigate if anyone attempts to support this. Better Voice Mail App – I think it’s ridiculous that I have to dial *86 to get voice-mail on my Galaxy Nexus. You’d think its 1998, not 2012. Apple’s phone app has dedicated voice mail button and its interface is excellent. Better Power Management – iOS devices seem to have power management than Android devices. Some of this may be a result of the fact that iOS doesn’t allow third-party apps to run in the background. Others might have to do with the fact that iPhone 4S has an under-clocked processor and no LTE support. Whatever the reason, it’s an Apple advantage. One-button Operation – Apple uses a single button to return to the Home screen, display the search box, and show recently opened apps. Is it intuitive? No, but once you learn it, it works well. Better Calendar app – Another thing I miss is the iOS calendar. I found it much easier to add appointments to the Apple Calendar than the Android Calendar. Better Cut & Paste – Although Android devices had cut and paste first, Apple has done a much better job implementing the feature. iOS devices have more region selection options and it’s much easier to quickly select text by dragging the region select handles around. Although this seems like a minor issue, it’s important to some users. You can enter phonetic pronunciations for Siri – iOS allows you to add phonetic pronunciations to your contacts which will tell Siri how to pronounce certain names. These are just some of the main advantages iOS 6 has over Android 4.2. Let me know if I left any major advantages out, and I’ll add them here. You should try Google Voice to replace the Voicemail on Android. Sure, it’s a separate app to download, but it now actually integrates into your call history and transcribes your voicemail for you. It also allows you to playback your voicemail without dialing any number. And the problem with “android only” apps is that for the most part they CAN’T be run on ios hahaha (SwiftKey, swype, tsf shell, etc). As far as bloat ware, that’s Per phone, not an OS comparison, not fair, and if you are going to compare non-stock phones you might as well throw in rooting/ROMs because the main reason people do this is to Get a stock experience, and it’s pretty easy to freeze and/or remove most bloat ware, esp when rooted. I’m not sure if you know this, but there is a tablet market for android too, but yeah they do have more specific apps for it, but android also handles non specific apps better. I do find it amusing they Do in fact have better overall app quality, but at the same time have more app crashes haha. He’s comparing the operating system ecosystem in general and a lot of Android devices don’t have visual voicemail or have to use a separate third-party app to get it working. The Android-only apps like SwiftKey aren’t really necessary on iOS since it’s keyboard triumphs anything Android has to offer, trust me I’ve tried all of them, I have both a Samsung Galaxy S 3 (rooted on AOKP 4.1) and an iPhone 5 (along with an iPhone 4S) and these just aren’t necessary. As for bloatware, in general, Android is like that of proprietary OS that came before it for carriers like Verizon (LG OS for the LG Voyager for example), it’s a way for them to put their useless applications on it and make some money from unaware smartphone users, and most Android manufacturers let carriers do so. Of course there are exceptions, like Nexus but eight out of ten Android devices sold in the US have bloatware and since Android is an open source OS there’s nothing we can do about it since it’s up to each individual manufacturer to decide on whether carriers are allowed to do so. Tablet applications for Android on the Google Play store are not very focused as they are on the App Store, most feel like smartphone apps just running enlarged on the screen. I would think they would have caught up after Nexus 7. Hopefully they do soon though, that Nexus 10 tablet is such a nice tablet. A lot of these points I can agree with, custom ROMs only go so far to fix it, and even then I miss some of the features of the stock ROM that actually helped make the S3 a better device over my iPhone. “Android is saddled with a USB port that can not host accessory devices.” While your point is about audio devices, I cannot comment on that since I have no experience on them. But my sgs3 sure can host USB devices, for example I can hook my DSLR camera, gamepad, keyboard and USB memory to my phone. I don’t know whether iPhone can do any of that, but I just wanted to clarify this. BTW thank you for these articles comparing the differences of the OSs, they are the most objective and balanced I’ve found anywhere. Thanks for the feedback. I’ve tried to make edits that address your and Karppi’s concerns. Accessibility – Apple provides a fairly comprehensive feature set for aiding users such as Vision assitance (VoiceOver, Speak Selection, Zoom, etc. ), Hearing Aid support, AssitiveTouch and Guided Access. AirPlay – Apple AirPlay allows convenient, easy sharing of content to AppleTV that very much embodies the holistic ecosystem approach of Apple. Cards – Often overlooked, Apple provides an application for iOS that allows the creation of beautiful letterpress cards from content captured or created directly on an iOS device. Cloud Services – iCloud offers synchronization of Calendars, Contacts, Documents & Data (an open API for apps), Find My iPhone, Find My Friends, Mail, Notes, Passbook, Photo Stream, Reminders and Safari (Bookmarks and Reading List). Customer Service – Apple Stores and Apple Support provide access technical expertise that is lacking in retail outlets. The ability to call or visit a retail store for technical support can’t be overvalued. Do Not Disturb – Apple iOS provides an integrated “Do Not Disturb” feature to disable calls and alerts when enabled. Game Center – Apple iOS (and Google Android) devices have vastly expanded the market for mobile gaming. Apple has surprisingly supported this development through the creation of a social gaming platform. iBooks Author – Although iBooks Author isn’t actually a iOS app, iBooks Author allows users to create content for iBooks which they can sell on iTunes. iBooks Author very much compliments the Apple approach which enables anyone to be a content creator with a powerful suite of content creation applications such as Aperture, Final Cut Pro X and Logic Pro. iLife – Apple iOS offers a consumer level content creation suite that integrates well with the desktop versions allowing users to capture, create and edit movies, photos and videos then either continue editing or publish on their desktop. iTunes – The Apple ecosystem is nowhere embodied moreso than in iTunes. iTunes provides access to apps, books, movies, music and television shows in more countries and languages than any competitor (Amazon, Google or Microsoft) and the difference in availability of content is dramatic. iMessage – Apple iOS provides a free, integrated messaging app that provides messaging functionality to Mac as well. iTunesDJ – Apple iOS integrates with iTunes on Mac to allow guests to choose music from the provided playlist. iWork – Apple iOS provides a nearly complete productivity suite that offers seamless integration with their desktop versions. Keynote, Numbers and Pages on iOS allow not only viewing but (some) editing of content with any edits automatically updating iCloud so the latest version is (almost) immediately accessible on the desktop version of the application as well. Language – Apple iOS provides integrated language support for dozens of languages, from native keyboards to speech recognition. Parental Controls – Apple iOS has a thorough feature set for restricting access to features, including; Content Restrictions (separate controls age appropriate controls for Apps, In-App Purchases, Books, Movies, Music & Podcasts, and TV Shows; Access to Camera, Deleting Apps, Explicit Language, FaceTime, iBookstore, iTunes, Installing Apps, Safari and Siri; as well as Guided Access mode to restrict use to specific features in a particular app. Privacy – Apple iOS offers extensive controls for Privacy, including which apps may access Bluetooth Sharing, Calendars, Contacts, Facebook, Location Services, Photos, Reminders and Twitter as well as the ability to “Limit Ad Tracking.” Apple Privacy controls are provided on a per app basis with initial approval required prior to apps gaining access to a particular data set. Responsiveness – Apple iOS is not a Davlik virtual machine on top of a Linux kernel which by nature is inherently faster than having multiple layers of abstraction. Security – The latest versions of Apple iOS and Google Android offer very good security with both solutions offering Address Space Layout Randomization (ASLR), Application Sandboxing, Code Signing, File System Encryption, Mobile Device Management (including Remote Wipe), Protected APIs, Secure Boot Chain. Apple iOS has several distinct and important advantages; Background Processes (managed by an API to prevent errant applications); Integrated SSL, TLS and VPN support including automatic encryption for default apps such as Calendar, Mail and Safari ; Multiple Abstraction Layers (Dalvik Virtual Machine on Linux kernel, every abstraction layer provides potential vulnerabilities); Numerous Ports (while often a definite advantage, hardware ports do offer potential vulnerabilities); and Software Updates (since Software Updates are managed by Apple, security updates can be developed and deployed rapidly). Siri – While difficult to state conclusively that Siri is superior to Google Now, Siri does provide several services that Google Now does not provide. Google Now certainly has an edge in predictive assistance whereas Siri provides more assistive features. One vast advantage for Siri is language support. Software Updates – Apple has to date provided several years worth of software upgrades for each hardware version. Software Updates are immediately available to all users of supported hardware anywhere Apple is supported. Trailers – The Apple iOS native app, Trailers, is the definitive movie trailer app. With an intuitive interface that allows east discovery of movies there is no better app for viewing upcoming movies and the integration with Apple Maps is convenient as well. Visual Voicemail – Apple iOS provides integrated Visual Voicemail. No downloading an app. No additional fees.